of Diego Facchini, IT Director HSE24 Spa. and Marco Ragogna, Head of Pre Sales Iws Consulting srl. IWS Consulting is an Italian advisory company running efficiently a business unit dealing with Data warehouse, analytics and Big data projects since 4 years. HSE24 is a best of breed company in the retail television market. Originally grewn up in Germany, in this last decade has opened branches in many european country. Among them, HSE24 Italy is active since seven years, with a brilliant every year overachievement in expected sales that set HSE24 high in the chart of the most market interesting companies. 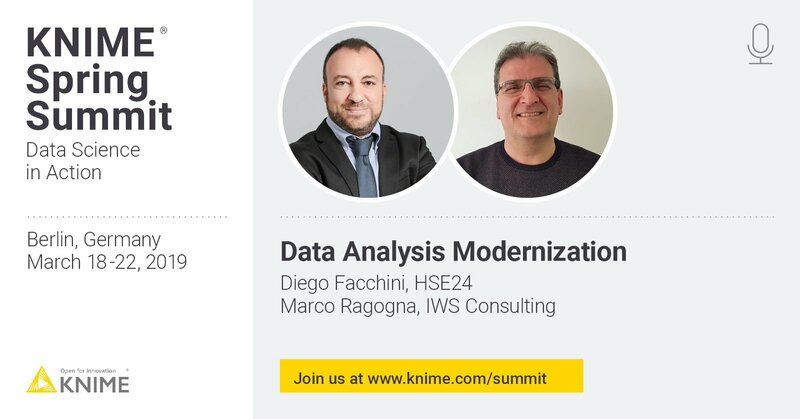 During this last year HSE24 Italy felt the need to address in a more rationalized way their approach to Data Analysis. Their previous existing environment suffered from stratification of different processes being implemented separately, and had several pains focused on specific elements like performances for final user, the need for a better organization of data governance and to respect new compliance rules for master data; furthermore there was a big push to reorder the business logic for the data integration flows and the deduplication of the relational entities involved in the environment. A new Data Analysis solution was redefined, designed and implemented, in order to not only have a more rationalized environment but also to be ready to move the focus of the platform from operational and descriptive analytics to a more statistical approach, the use of predictive analytics and machine learning. Knime Analytics Platform and Server were used as core element technology for the new implementation. Developement processes and deploying to production were managed through iterative ‘agile’ working cycles, combining in a single workgroup customer business knowledge and advisory consulting processes implementation. The new environment is now used for all the initiatives focused on prediction and machine learning. More projects are starting over to improve business perspective for HSE24, covering all the main aspects of Bayesian statistics and machine learning, with many more use cases in roadmap. The latest initiatives focus on Market Basket Analysis, Unsupervised clustering compared to predefined clusters for Customers, prediction and classification for Programming, Buying and Sales.